Despite the recent reduction in cost of lithium ion batteries driven by mass manufacture, the widespread adoption of battery electrical vehicles is still hindered by cost and durability, with the lifetimes of the batteries falling well below the consumer expectation for long-term applications such as transport. Additionally, fast charging of battery electric vehicles is crucial to help assuage range anxiety and provide the operational convenience required for mass adoption of the technology. Fast charging, however, can rapidly accelerate degradation and even trigger degradation mechanisms that are not present in 'normal' operating conditions. A key goal for the automotive industry is to better understand the causes and mechanisms of degradation to enable improved control and prediction of the state of health of battery systems. 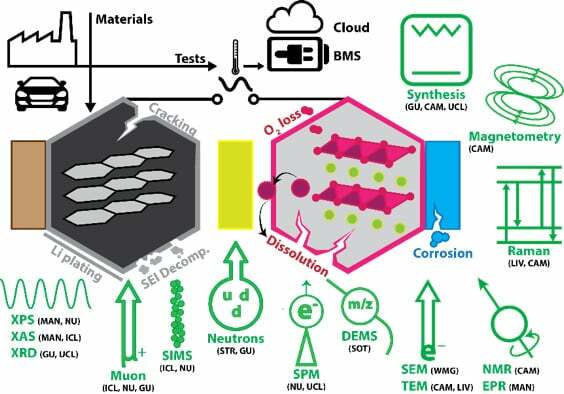 Degradation mechanisms can occur on length-scales from the nano to the macroscopic, and timescales from seconds up to years; a full understanding of the causes and effects of degradation of lithium ion batteries for automotive applications therefore requires synergistic investigation across these length and time scales and with the combination of many experimental techniques. 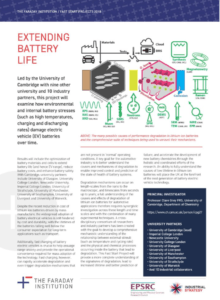 A cross-disciplinary consortium of researchers and industry partners has been created with the goal to develop a comprehensive mechanistic understanding of the relationship between external stimuli (such as temperature and cycling rate) and the physical and chemical processes occurring inside the battery that lead to degradation. This project will provide a more complete understanding of the signatures of degradation, lead to increased lifetime and better prediction of failure, and accelerate the development of new battery chemistries through the holistic and coordinated efforts of the research. An ability to fully understand the causes of low lifetime in lithium ion batteries will place the UK at the forefront of the next generation of battery electric vehicle technology.